Jeroen ten Berge has turned the tables on me! He’s delivered an incredible cover design, and I haven’t finished writing the book! As always, Jeroen scored a bullseye. 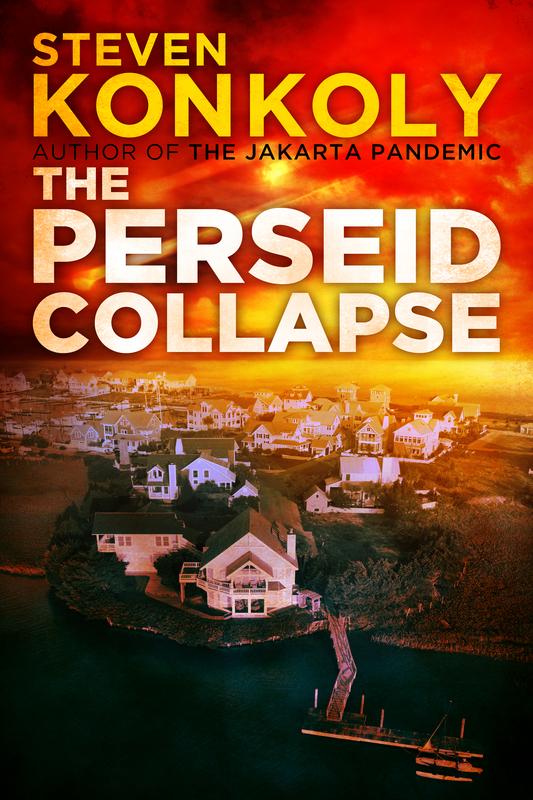 His design brilliantly captures the core essence of The Perseid Collapse’s sweeping apocalyptic world. “2019. Six years after the Jakarta Pandemic, the United States stands at the brink of a fiscal and industrial resurgence. Stories of prosperity and confidence dominate the headlines, orchestrated to distract the nation from a dangerous current of hostility and fear—running strong below the surface. Nobody has forgotten the horrors of the Jakarta Pandemic. Sickness. Hunger. Desperation. Unspeakable violence. The cover is magnificent! Congratulations. It’s really amazing. Jeroen’s work is unbelievable. I wish I had something to do with it, but I didn’t! No problem, Barbara. Sounds like a plan. Let me know if you need me to provide anything else. Love the cover! Can’t wait for the book to come out. Are you still enjoying ‘retirement’?